Philip Samuel Masi was born on January 6, 1916 in Chicago Illinois. He was first signed by the Cleveland Indians in 1936 but was let go &then signed with the Boston Braves. 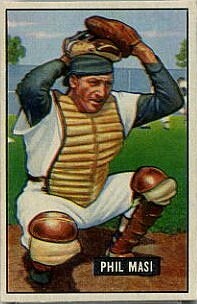 He made it to the big leagues by 1939 first as backup catcher to Al Lopez. The next two seasons he played behind Ray Berres & then Hall of Famer Ernie Lombardi from 1942-1945. 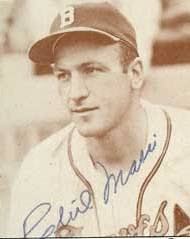 When Lombardi got traded to the New York Giants that year, Masi became the Braves full time catcher. He was known for his great defensive abilities, leading all catchers in fielding three times, put outs & assists one time each. He threw out 40% or more of would be base stealers eight times in his career, including three seasons of 50% or better. He made three straight All Star teams from 1946-1948 getting to the World Series in 1948 as well. He hit over .270 three straight seasons (1943-1945) with a career high 25 doubles in 1945. In 1946 he batted .267 with 55 walks & a .358 on base %. His defense was so good he was considered in the MVP voting two straight seasons. In 1947 he may have had his best season, batting .304 (tenth best in the league) with a career high nine HRs, he hit 22 doubles with four triples seven stolen bases (10th most in the league)& drove in 50 runs. 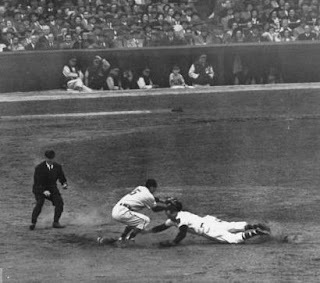 Post Season: In the 1948 World Series against the Cleveland Indians he came in to pinch run in Game #1. 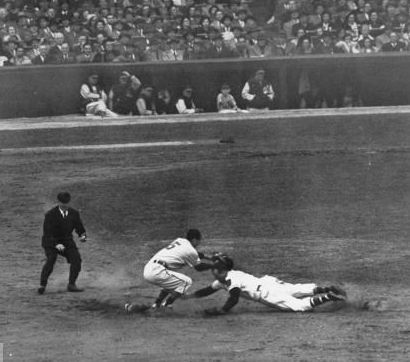 Bob Feller appeared to have picked Masi off base, but he was called safe by the umpire. The Braves Tommy Homes then singled, scoring Masi with the only run of the game. Cleveland did go on to win that World Series, but they haven’t won another championship since that year. Masi's only hit in the Series was an RBI double giving him a .125 batting average. He spent over ten seasons with the Braves, catching the great Hall of Famer Warren Spahn as well as Johnny Sain & knuckleballer Jim Tobin. In April of 1944 Masi caught Tobin’s no hitter against the Brooklyn Dodgers. In 1949 with a young Del Crandal was on the scene to replace him at catcher. 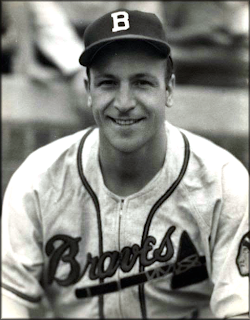 The Braves traded Masi to the Pittsburgh Pirates for Ed Sauer. After the season his contract was purchased by his hometown Chicago White Sox, where he hit .279 as the Sox main backstop in 1950. He handled the pitching staff well bringing them from the leagues sixth best ERA up to the second best by 1951. He played three seasons on the south Side of Chicago, winding down his career as a backup catcher & pinch hitter. Masi finished his career in 1952, after 14 seasons (1229 games) he batted .264 with 917 hits 47 HRs 164 doubles 31 triples a .344 on base % & 417 RBIs. At catcher he posted a .983 fielding % throwing out 39% of would be base runners. Retirement: After his playing days he worked in the printing business in Illinois. He passed away at age 74 in 1990 at Mount Prospect, Illinois. After his death his wife revealed that said he really was out in that World Series pick off at second base.